This 9 night, 6 round fixed itinerary is fully managed for a party of 24-30 guests who will visit Gleneagles, St Andrews and Turnberry. The golf is exceptional including four venues for The Open beginning with the fabled Old Course, St Andrews along with Carnoustie, Royal Troon and the wonderfully remodeled Ailsa Course at Turnberry. Our Non-Golfing guests will enjoy a full sightseeing schedule ranging from castle tours to Edinburgh and a walking tour of St Andrews. ... Read More. Building on the success of our expanding worldwide portfolio of escorted golf tours and cruises, and further to the success of our 2018 Pilgrimage to the Home of Golf, we are delighted to present an outstanding new Escorted Tour for Scotland. Once again guaranteed play is included on The Old Course, St. Andrews; 29 time host of The Open and where the 150th Open will be played in 2021. Three other Open venues are also included; 2018 host Carnoustie, the spectacularly renovated Ailsa Course of Turnberry Resort; and Royal Troon where Henrik Stenson’s 63 on Sunday in 2016 bettered Phil Michelson’s 65 for the Claret Jug. 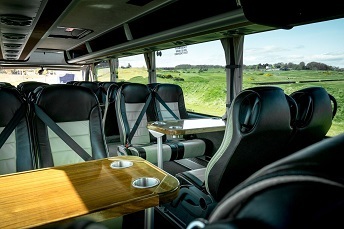 Sightseeing for our Non-Golfing guests, along with Golfers on several occasions, includes a day trip to Edinburgh, a walking tour of St Andrews and a tour of Glasgow. We’ll also visit Stirling Castle & the Wallace Monument; Falkland Palace, Culzean Castle & Country Park along with the new Kingsbarns Distillery. Our accommodations are of the highest standard beginning with world renowned Gleneagles Hotel for two nights followed by four in St Andrews at the Fairmont then three nights at the Trump Turnberry Resort perched high on an escarpment overlooking the golf course with striking views across the Firth of Clyde. If you enjoy combining your love of golf with a passion for travel, you’ll find a relaxing and highly rewarding experience on this Escorted Tour for a party of 24-30. Every aspect is fully managed from the handling of your luggage and equipment to hotel and golf course check ins. Various meals including a full breakfast each day, guided sightseeing, carts / caddies, local taxes, service charges and gratuities (excluding caddies) are included in addition to sandwiches, snacks plus an open bar for beer and wine during our time at each of the golf courses. We hope you will join us in Scotland for this most special tour in the company of like-minded new friends. Arrive Glasgow or Edinburgh Airport. Met on arrival where you will be transferred to relax at your hotel, Gleneagles. Since opening its doors in 1924, this magnificent countryside estate in the heart of Scotland has been known as a “Riviera in the Highlands”. Today it’s unrivalled cuisine and luxury accommodation combine with the outdoor facilities and stunning views over Perthshire to ensure Gleneagles continues it's reputation as one of the greatest establishments of its kind in the world. This evening Welcome Cocktails & Dinner. GOLF: Today play the King's Course of Gleneagles Hotel. The King's course was the inspiration of James Braid, five time winner of the Open championship. It opened in 1919, representing the finest 'classical' golf course design. It is certainly one of the most beautiful and exhilarating places to play golf in the world. With the sweeping views from the tees all around, the rock-faced mountains to the north and the green hills to the south, and the peaks of the Trossachs and Ben Vorlich on the western horizon. SIGHTSEEING: Non-Golfers enjoy a morning visit to Stirling Castle and the Wallace Monument; both great symbols of Scotland and a source of national pride. The Castle's long, turbulent history is associated with great figures from Scotland’s past such as William Wallace & Mary Queen of Scots. The Monument is a 220 feet sandstone tower build between 1861 and 1869 and the climb to the top is not for the faint-hearted. In the afternoon a chance to relax and enjoy the resort facilities of Gleneagles Hotel. The remainder of the afternoon is free for Golfers and Non-Golfers to relax and enjoy the many resort activities. This morning we make our way through the Kingdom of Fife to St Andrews where we will enjoy a fascinating walking tour of St. Andrews visiting St. Andrews Castle, parts of St. Andrews University, and taking in the ruins of St. Andrews Cathedral, once one of the most important religious sites in Europe. Old Tom Morris and his son young Tom, are buried in the Cathedral Grounds. St. Andrews also offers a wide selection of shopping within a very convenient central area. After check in at the Fairmont Hotel the afternoon is free to relax or explore St Andrews further on your own. This evening enjoy dinner with your group in a local restaurant (included). GOLF: In the Open rota since 1931 and having hosted the event on 7 occasions, Carnoustie will again do so in 2018. It is regarded perhaps the most difficult course the game's greats face in golf's oldest championship. While the links is relatively flat it is exposed to the elements. A combination of length and accuracy are required as golfers face narrow corridors from the tee. Approach shots demand precision to the greens heavily guarded by steep bunkers and burns. Arguably the toughest finishing holes in championship golf, errant shots are severely penalized. SIGHTSEEING: Non-Golfers enjoy a visit to Falkland Palace; Built between 1501 and 1541 Falkland is one of Scotland’s finest Renaissance palaces, a place adored by Mary, Queen of Scots. Explore this treasure trove of fascinating 17th-century artefacts, see the magnificent Chapel Royal, and walk in the colourful and diverse grounds. The palace is also home to the world’s oldest surviving real tennis court. GOLF: Today challenge the Old Course of St. Andrews the ''Home of Golf''. The Old Course has played host to the greatest golfers in the world and produced many of golf's dramatic moments. Wide double fairways, seven extensive double greens, and a multitude of intimidating bunkers are just some of the unique features you will encounter. *Please note the actual day of play for the Old Course is subject to final confirmation. ** In order to play the Old Course an official handicap card is required from a golf club affiliated to the USGA, State Golf Association or equivalent governing body in the country in which you reside. The maximum handicaps for play on the Old Course are 24 Men & 36 Ladies. After golf we will have a putting competition at The St Andrews Ladies’ Putting Club, better known as “The Himlayas”. The nickname is well deserved and it is a stern test of skill and nerve. SIGHTSEEING: Non-Golfers will today make the 90 minute drive to enjoy Edinburgh, capital city of Scotland; famous for its Parliament, Castle, Holyrood Palace, history, architecture, festivals, and city walking. The city is divided between the Old Town and the New Town. The Old Town is where you will find the greatest gathering of historical buildings whilst the New Town is more a celebration of business, order and classical Georgian architecture. This is the terrain of the shops, offices and banks as well as many bars and cafes. Enjoy an overview of the city before having free time to explore on your own. GOLF: When the Castle Course opened in 2008 it was the first new golf course built for the St. Andrews Links Trust in over 100 years and the first ever outside of town. Scots architect David McLay Kidd, creator of Bandon Dunes, transformed a farm along the coast 2 miles east of the city center into a "modern links" layout comparable to Kingsbarns and Castle Stuart. The setting is striking with wonderful views of St. Andrews and St. Andrews Bay plus a collection of seaside holes played along, around, and over rugged cliffs. A caddie is well worth your employ at the Castle Course if for no other reason than your tee shots - the line you want is seldom the one you see. SIGHTSEEING: Non-Golfers this morning will enjoy walking a stretch of the Fife Coastal Path from the cosmopolitan atmosphere of St.Andrews to the former coal mining towns of central Fife. The small fishing villages of the East Neuk to the bustling industrial areas of the west, rugged cliffs, award winning beaches, internationally important estuaries and wildlife reserves, walking the Fife Coastal Path offers a flavour of the history. Industry and culture of this part of Scotland. This afternoon Golfers and Non-Golfers alike will have the opportunity to visit the new Kingsbarns Distillery for a guided tour and whisky tasting. The vision of local caddie Douglas Clement Kingsbarns Distillery opened in 2014 making it one of Scotland newest distilleries. 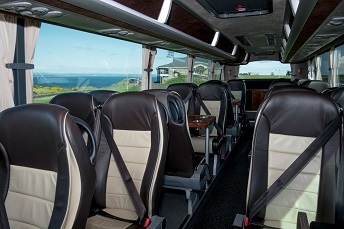 Enjoy a leisurely day as we travel from St Andrews to Turnberry. Our journey will take us through the Kingdom of Fife before stopping in Scotland’s 2nd city of Glasgow where we will enjoy a tour. Scotland's biggest city has evolved over the last couple of decades to become one of Britain's most intriguing metropolises. From the soberly handsome Victorian buildings, legacies of wealth generated from manufacturing and trade, and museums to the stylish bars, excellent restaurants and one of Britain's best live-music scenes as well as world class shopping the city is truly captivating. Early afternoon arrival at Turnberry where we will enjoy lunch (included). GOLF: Today play the Ailsa Course at Trump Turnberry. The course has undergone a redevelopment and reopened with a stunning new layout in June 2016. Lying on a spectacular curve of rockbound coast in the southern reaches of Ayrshire. The course now makes the most of the coastal scenery especially from the 4th through the 11th passing the famous landmark lighthouse at the turn, which is now a stunning halfway house. This is a demanding links course, and an ever-present wind will make for a tough examination of your golfing skills. In 2009 the Ailsa Course hosted The 138th Open for the 4th time when golfing legend Tom Watson lost out to Stewart Cink in a playoff for the Claret Jug. SIGHTSEEING: Non-Golfers will enjoy a visit to Culzean Castle & Country Park. Converted by Robert Adam to include a ‘Roman’ viaduct and Ruined Arch to add drama to this Italianate castle in its spectacular cliff top setting. It contains a fine collection of paintings and furniture, and a display of weapons in the Armoury. The Circular Saloon has a superb panoramic view over the Firth of Clyde and the beautiful Oval Staircase is Robert Adam’s final masterpiece of interior design. In 1945 the top floor was given to General Eisenhower as a token of Scotland’s recognition of his role during World War II. The remainder of the afternoon is free for Golfers and Non-Golfers to relax and enjoy the many resort activities. This evening enjoy Farewell drinks and dinner with your group (included). GOLF: Today play Royal Troon. Nine time venue of the British Open, the course most recently hosted the championship in 2016. It is consistently praised for its testing but fair set up. A long and demanding links, Troon unusually boasts both the longest and the shortest holes in Open Championship golf, being the Postage Stamp 8th at 126 yards, and the 6th at 577 yards 6th named Turnberry. SIGHTSEEING: Non-Golfers enjoy a morning visit to Dumfries House, one of Britain’s most beautiful stately homes and best kept heritage secrets. Saved by the intervention of HRH the Prince of Wales in 2007, Dumfries House combines the architecture of Robert Adam with the furniture of Thomas Chippendale and leading 18th century Scottish cabinet makers. 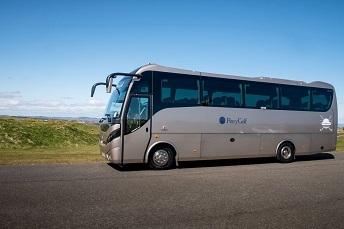 On the return journey we will take in the scenic beauty of the Heads of Ayr and the ruins of 13th century Dunure Castle built for John de Kennedy. After breakfast transfer to Glasgow Airport for homeward flights. The King's Course was the inspiration of James Braid, five time winner of The Open. It opened in 1919, representing the finest 'classical' golf course design. It is certainly one of the most beautiful and exhilarating places to play golf in the world. With the sweeping views from the tees all around, the rock-faced mountains to the north and the green hills to the south, and the peaks of the Trossachs and Ben Vorlich on the western horizon. Located two miles from St Andrews town centre, and following the Fife coastline, the Castle Course is a wonderful addition to the St Andrews Links Courses. The designer, David McLay Kidd, creator of Bandon Dunes in Oregon, created a typical Scottish golf experience with wonderful views over the town and the North Sea. It has been designed with tradition very much in mind. Approaches will allow for bump and run as well as pitches and the heavily contoured greens are fantastic. Gleneagles Hotel, most famous of Britain's country hotels and synonymous with excellence, is set in its own 850 acre estate, surrounded by magnificent countryside. Renowned world-wide, the 5 star resort is famed for many attractions, not least its three internationally celebrated golf courses providing an unsurpassed variety of challenges and pleasures throughout their combined 54 holes. James Braid's designed courses, the King's and Queen's, have themselves become legendary. The addition of the Signature Nicklaus design PGA Centenary Course has greatly enhanced the reputation of their premier golf resort, which played host to the 2014 Ryder Cup. The hotel opened in 1924 and over the years the King's has hosted numerous major events, including the first ever professionals' match between Britain and America in 1921, the forerunner of the Ryder Cup. Some of the finest shooting and fishing in Britain is readily available in almost all conceivable sporting forms. The Spa by ESPA has been designed by award winning interior designer Amanda Rosa. Every aspect of the unique and tranquil space enhances the therapeutic ESPA treatments. The calming relaxation rooms and the spacious, naturally lit courtyard allow you to rest your body and mind pre and post treatment. Each of the hotel's restaurants has its own style, but the hallmark of all is the use of the finest fresh produce available locally in Perthshire and Scotland, as well as from specialist suppliers around the world. The Strathearn is a grand restaurant, serving the finest Scottish dishes. Deseo serves Mediterranean cuisine in a relaxed, informal environment while Andrew Fairlie at Gleneagles, the only 2 Michelin star restaurant in Scotland, provides the ultimate fine dining experience where the cuisine is unashamedly French but with a Scottish twist. Unrivaled cuisine and luxury accommodation combine with the outdoor facilities to ensure Gleneagles continues it's reputation as one of the greatest establishments of its kind in the world. 9 nights accommodations in room categories as listed based on twin occupancy at selected hotels. 4 included dinners. 1 included lunch. Beer, wine & soft drinks with included dinners/lunches. Green fees for 6 rounds of golf including caddie fee (excludes gratuity of suggested £15-£20 per round). All sandwiches, snacks and open bar for beer, wine and soft drinks during our time at each of the golf courses. Light lunches for guests on sightseeing days where scheduling permits.